Here at Honors Graduation we have everything that you (or your graduate) will need for your big day. There are many reasons to come together and celebrate graduating students, each student who has put in their maximum efforts to reach this point deserves to be honored. You have made it all this way because of your determination and hard work, be sure to reflect on everything that you have accomplished along with the friends and lasting memories that you have made as well during this time of celebration. With a little help from us you will be looking marvelous for your ceremony. Students typically wear a cap and gown at the time of their graduation, it is not uncommon for students to wear graduation tassels on their cap as well. We have all of your wardrobe needs for this graduation with excellent pricing. 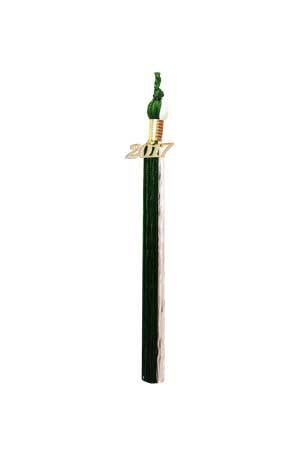 Our graduation tassels in forest green and gold is a prominent choice. The colors come together perfectly for a bold way to represent yourself amongst your fellow graduates. You can easily add a charm to your tassel for a small additional fee, we have years from 1988 all the way up to present so whether you are just graduating or looking to replace your tassel we have you covered. After collecting their diploma, sometimes students will move the tassel from one side of their cap to the other. Honor students have been known to show it by wearing unique tassel colors. Our tassels are well constructed, here at Honors Graduation we bring you only the highest quality when it comes to graduation attire. Our tassels are a great item to hang onto after your graduation as a token of all your hard work, many students hang them in their rearview mirror as a constant reminder that they can achieve anything.